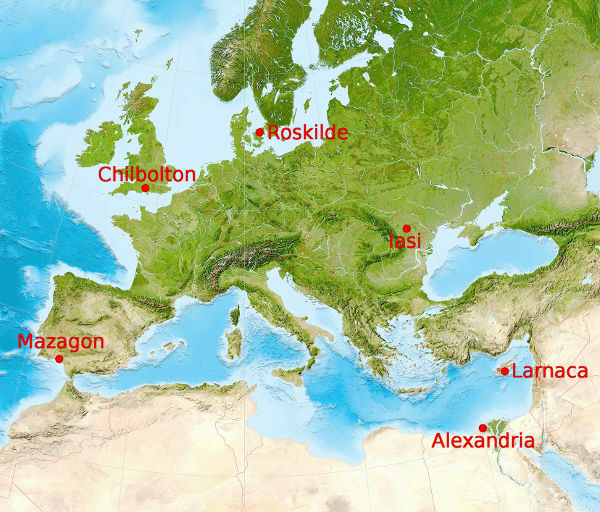 ZEUS is a long-range lightning detection network with receivers located at six sites over Europe (Chibolton in UK, Roskilde in Denmark, Iasi in Romania, Larnaka in Cyprus and Mazagon in Spain, Alexandria in Egypt). The system was manufactured by Resolution Displays Inc. ZEUS receivers record the radio noise (sferics) emitted by cloud-to-ground lightning discharges in the very-low-frequency (between 7-15 kHz). A typical CG lightning strike excites electromagnetic energy that propagates along the ground (i.e., ground wave) and between the Earth’s surface and the lower part (D-layer) of the ionosphere (i.e., sky wave) in the natural Earth-ionosphere waveguide. Each ZEUS receiver measures the vertical electric field of the propagating sky wave, while sampled time series are synchronized between the different receivers using time stamps from collocated GPS clocks. The VLF signal is preamplified at each receiver site and the signal is synchronized to geographic positioning system time. At each receiver site an identification algorithm is executed that detects a probable sferics candidate, excludes weak signal and noise and is capable of capturing up to 70 sferics per second. Then the lightning location is retrieved (at the central station of the network) using the arrival time difference (ATD) triangulation technique. Namely, measured ATD values are extracted for every receiver pair by maximizing the temporal cross-correlation of the waveforms sampled by each receiver. An ATD defines a hyperbola of possible lightning source positions over the Earth’s surface associated with the same arrival time difference. Combining the hyperbolas of all ATD pairs, we can identify a common point of intersection, which uniquely defines the location of the lightning strike. ZEUS locating algorithm requires a minimum of four receivers to record the same event.